British Prime Minister, Theresa May, on Tuesday told lawmakers to hold their nerve over Brexit and give her more time to negotiate a deal acceptable to both the EU and the country’s parliament. The United Kingdom is on course to leave the EU on March 29 without a deal unless May can convince the bloc to amend the divorce deal she agreed in 2018 and get it approved by British lawmakers. British lawmakers rejected May’s withdrawal deal in January, with the major sticking point being the Irish ‘backstop’ – an insurance policy to prevent the return of a hard border between British province Northern Ireland and EU-member Ireland. The EU says the backstop is vital to avoiding the return of border controls in Ireland and has refused to reopen the Brexit divorce deal, although May insists she can get legally binding changes to replace the most contentious parts of the backstop. 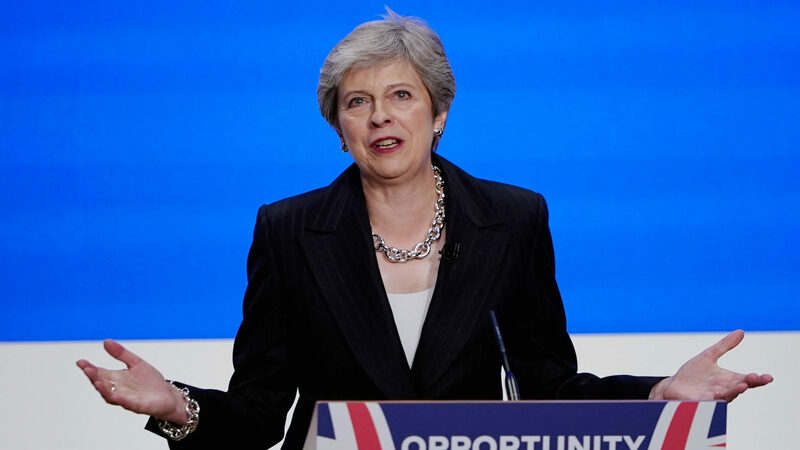 “By getting the changes we need to the backstop; by protecting and enhancing workers’ rights and environmental protections, also by enhancing the role of parliament in the next phase of negotiations I believe we can reach a deal that this House can support,” Mrs May said. The EU’s Brexit Negotiator, Michel Barnier said on Monday the bloc would agree to tweak the political declaration on EU-UK ties after Brexit that forms part of the package. Also to reflect a plan for a closer future relationship that could remove the need for the backstop. “It’s clear from our side that we are not going to reopen the withdrawal agreement but we will continue our discussion in the coming days,” Mr Barnier said. Mrs May is pursuing three options in talks with Brussels: negotiating a way for Britain to leave the backstop without needing EU agreement, agreeing a time limit to the backstop, or finding an alternative arrangement that replaces it altogether. Mrs May said if she had not yet reached a deal in Brussels, she would deliver another progress report on Feb. 26 and provide another chance for parliament to express its opinion on her approach the following day. Opponents of Brexit argue Mrs May is deliberately delaying so lawmakers will be faced with the option of backing her agreement or leaving without a deal, a disorderly exit that businesses fear will cause widespread damage to the economy and jobs. May, who delayed a vote on the deal in December when it was obvious parliament, would reject it, responded to Corbyn by saying that she was not responsible for the delay, instead blaming parliament’s failure to back it. “I wanted to have this sorted before Christmas, I brought a deal back. It’s not me who’s trying to run down the clock,” May said, drawing hoots and jeers from opposing lawmakers.